Bob has never thought much of the beer in here; pint of 6X in October 2007 was disgusting. 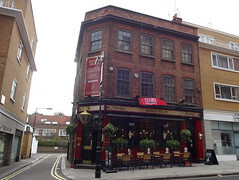 Kake decided to give it another chance in July 2009; first impressions were promising, with five real ales available on handpump (Thwaites Lancaster Bomber, Titanic Longitude, Adnams Broadside, Old Peculier, and London Pride). I had a half of Old Peculier (£1.56), which was sour and obviously off. To their credit, they had no problem giving me my money back. Last visited by Kake and Richard, 13 July 2009. Food details and opening hours taken from the 2007 Good Beer Guide. Last edited 2016-10-26 08:49:14 (version 17; diff). List all versions. Page last edited 2016-10-26 08:49:14 (version 17).